Super Bowl Party Tips: Lets Get Ready For Some Football! Now that we know the Super Bowl is between the New York Giants and the New England Patriots, have you thought about how you’re going to plan the BIG day? Well, if not, no worries! 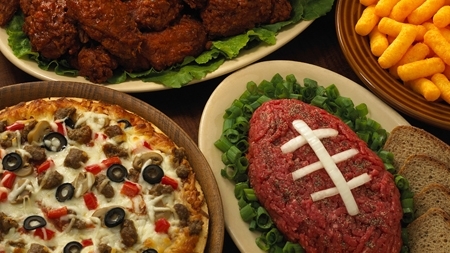 Here are some of our tips for hosting on a fantastic Super Bowl Party. During the Super Bowl, the TV is a huge component. Make sure your TV is centrally located so everyone has a good angle to watch the game and commercials. When the game is not on, everyone is glued to the commercials. When the commercials are not on, they are glued to the game. So, make a cozy environment around the TV. The big question is this: is there enough room? If your couch and chairs cannot hold all your guests, do not be scared to use the floor. The floor can be comfy if you throw some big pillows down around the room. Don’t be afraid to do so. Invite your guests to wear their favorite team jerseys. If they do not have a football jersey of their own, invite them to wear the team colors of the team they want to see win. The Super Bowl is about a winning team, and wearing the pride of your team, so let them SHOW it. There are a variety of ideas to bring a little football magic to the food you will be serving. There are everything from ’stadium cakes’ to ’football pizzas’ to ‘football cheese balls’. There is a possibility for every idea. Start thinking creativity with how you want to showcase the food you will be serving. The internet has some great recipes you can browse. A lot of Super Bowl Parties are snack induced. Trust me, those are very important, but don’t forget to serve an easy to eat meal. Some favorites are: Sloppy Joes, Burgers, Pizza, and Stadium Dogs. You can easily keep with the snack theme, but incorporate a meal since game time is 3:30pm PST / 6:30pm EST. When guests arrives at the beginning of the game, invite everyone to write down their guess as to what the final score of the game will be. At the end of the game, look through the numbers and give a door prize to the closest guess. Perhaps someone hit it right on. A more traditional game is Super Bowl Squares. Prizes are awarded at the end of each quarter based on the scores of the game. Check out the complete rules. After the majority of Super Bowl games I remember watching, it’s the commercials that get talked about the next day, more so than the game. Just sit back to enjoy the commercials with friends! No matter if you’re into the game or commercials, it’s guaranteed to be a good time. Have fun with it, and most importantly, enjoy your company!